Manchester United players are on their way back to Old Trafford after international duty and will start preparing themselves for the high octane clash against Liverpool this weekend. We look at how the Manchester United stars fared for their respective nations during the break. The likes of Blind and Depay faltered, whereas, in form Wayne Rooney and Luke Shaw could well be the undoing of Brendan Rodgers this weekend. The Dutch continue to struggle in the Euro Qualifiers and missed out on three valuable points against Iceland. Swansea star Gylfi Sigurdsson scored the winner from the penalty spot. Manchester United duo Daley Blind and Memphis Depay started the game, but failed to make any impact whatsoever. The former PSV star Depay was criticized by Dutch legend, van Hanegem after the defeat against Iceland. 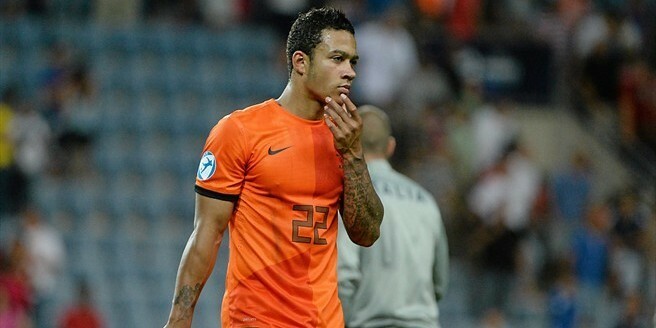 According to the former national team star, Depay is way too self-absorbed and is not concentrating on football. 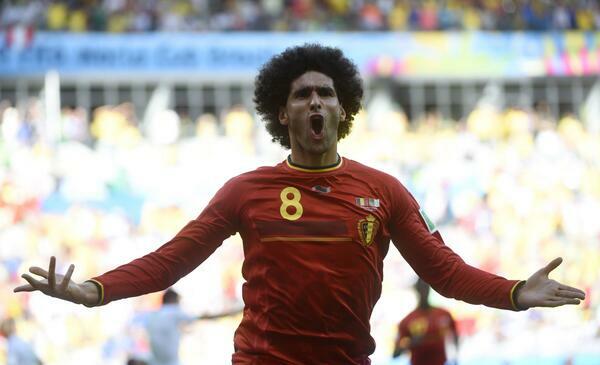 Belgium picked up an important win against Bosnia thanks to goals from Manchester United midfielder, Marouane Fellaini and his compatriots, Hazard and De Bruyne. Fellaini put on a combative performance, meanwhile, on loan midfielder Adnan Januzaj was an unused substitute. Italy picked up a narrow win in their Group H tie against Malta. Southampton striker Graziano Pelle scored the only goal of the game. Manchester United new boy Matteo Darmian had a game to remember. The Italian right back was in outstanding form and was the man of the match. 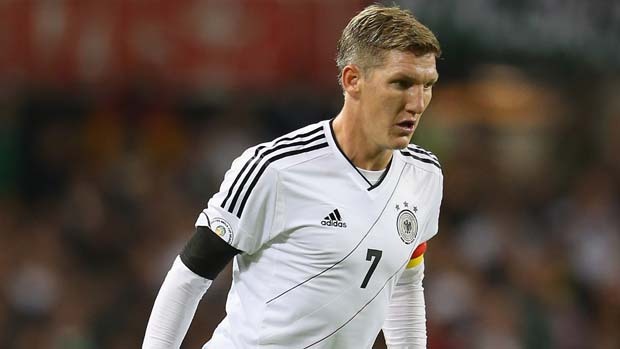 Germany roared past Poland during their Group D encounter. Mario Goetze was the star of the show with a brace. Manchester United midfielder Bastian Schweinsteiger had a neat game, with little to do. Germany dominated from start to finish with the likes of Kroos and Gundogan running the show. 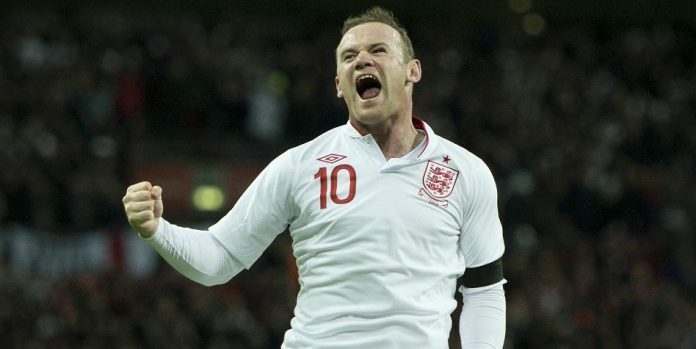 England secured a thumping 6-0 win over San Marino and Manchester United star Wayne Rooney was on the score sheet. Defender Luke Shaw had a solid game at left back. 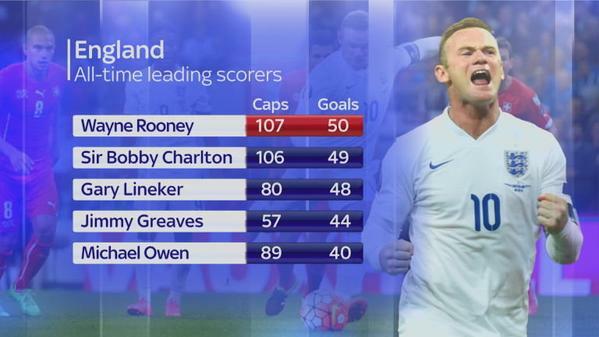 Rooney also topped the England scoring charts, beating Bobby Charlton’s goal tally. Michael Carrick and Chris Smalling were unused substitutes. David de Gea and Juan Mata were unused substitutes as Spain beat Slovakia 2-0 during their Group C encounter. Netherlands slumped to another massive defeat during this international break as the Dutch were taken apart by an inspired Turkish side. Manchester United duo, Blind and Depay had a game to forget. Belgium nicked an important win against Cyprus, thanks to a late winner from Chelsea star Eden Hazard. Manchester United duo, Marouane Fellaini and Adnan Januzaj were in the squad. Fellaini lasted for an hour as Januzaj was left on the bench, unused. Daniele De Rossi scored the only goal before getting sent off as Italy picked up another narrow win. Apart from a few rash tackles, Manchester United defender Darmian had a good game at right back. Germany and Scotland played out an entertaining five goal thriller with the World Champions edging it 3-2. Manchester United midfielder, Bastian Schweinsteiger had a quiet game and failed to make the kind of impact he would have liked. Spain picked up a narrow win against Macedonia in the Group C encounter, thanks to Manchester United star Juan Mata. The Spaniard scored the only goal of the game. Meanwhile, David de Gea was also back in the starting lineup, but had a poor game by his standards. Perhaps a bit rusty? England struggled to break down an organised Swiss side in the first half, but the hosts scored twice in the second half through Tottenham star, Harry Kane and Manchester United captain, Wayne Rooney. Rooney scored his 300th goal for club and country and defender Luke Shaw had an amazing game. The former Southampton left back was easily the man of the match. Blaise Matuidi scored two brilliant goals to give France a narrow win over Serbia. Manchester United duo, Morgan Schneiderlin and Anthony Martial were in action as well. Schneiderlin had a quiet game at the middle of the park and did a decent job breaking the play up. Martial, new signing at Old Trafford, came on late and had a quiet outing as well. Manchester United keeper, Sergio Romero had a quiet outing in between the sticks as Argentina smashed 7 goals past a hapless Bolivia side. Manchester United defender, Marcos Rojo was an unused substitute. France was once again the nemesis for Portugal as the Les Bleus won the game right at the end, thanks to a wonderful free kick from Mathieu Valbuena. Manchester United signing Anthony Martial came on with 15 minutes to play and Morgan Schneiderlin played one half. Both players struggled to stand out in a cagey affair.